For anyone that reads this regularly, you know I’m a pretty big fan of Google products. So, when they announced the launch of Chrome, their web browser, I was quick to install and start browsing with it. It has since become my default browser (other than when testing webpage rendering) on both my personal and business computers. Chrome got rid of the ‘fat’ around the browser giving me the tools/options I use the most and increasing my viewing area. Another great feature is the fact that each tab runs independently so if one crashes it doesn’t destroy your entire browser session. Just that one tab! One thing I do wish they had though, ALT+F+C/X to close a tab. However, that’s a discussion for another day. Anyways, I’ve been using Chrome extensively the last few weeks and was disappointed when I discovered that there doesn’t appear to be any built-in XML/RSS rendering support. I already use Google Reader so I’m not looking for an IE approach (feed in the browser – I don’t even use the browser), but something similar to Firefox would be nice if I happen to land on a page that is XML/RSS. Not only does it not offer a way for me to subscribe to the document, it just displays raw text. Here are some screenshots for comparison. I’m disappointed but I’ll continue use Chrome. 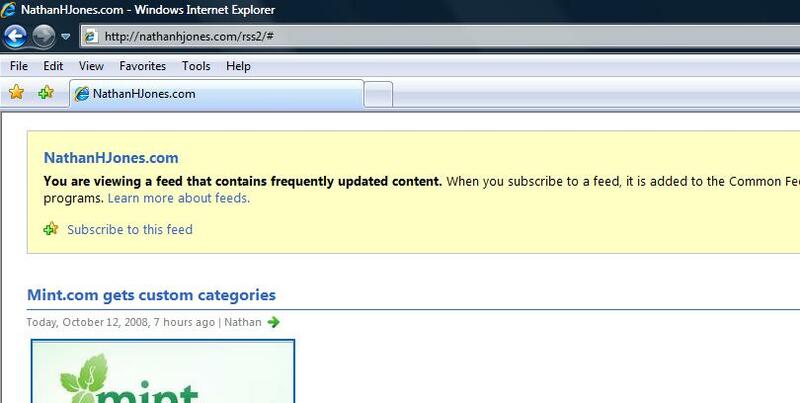 It just makes it more difficult to subscribe to things than it was with Firefox. This entry was posted on Wednesday, October 15th, 2008 at 8:11 am	and is filed under technology. You can follow any responses to this entry through the RSS 2.0 feed. You can leave a response, or trackback from your own site.